Tues- Fri: 10:30 to 2:30 p.m. and 4-8 p.m.
Not all Cryo machines are created equal! Our Cryo machine is FDA approved for Consumer Use. We use liquid Nitrogen, not refrigeration to give our client's the most effective results every time. First time client special $25 cash. Surf City Cryo provides cutting-edge extreme cold whole body cryotherapy sessions in a comfortable, relaxing spa environment. Whole Body Cryotherapy is used to reduce chronic pain and inflammation, hasten injury repair, increase cell rejuvenation, improve skin tone and even reduce signs of aging. Surf City Cryo prides itself in providing the best whole body cryotherapy services to Huntington Beach! We care about your comfort. Like the best spas, we do NOT share robes/socks/gloves. They are cleaned after EVERY use. Warm tea or alkaline water is also available to you at no charge after or before your session. We care about your privacy. This is why we use open-top saunas with no windows in the door. This allows you freedom from fully encapsulated enclosures. We care about your budget and we know your time is valuable. This is why we start our machines at 20-40° degrees lower than other cryotherapy centers. Sessions at other facilities normally begin at -160°F. 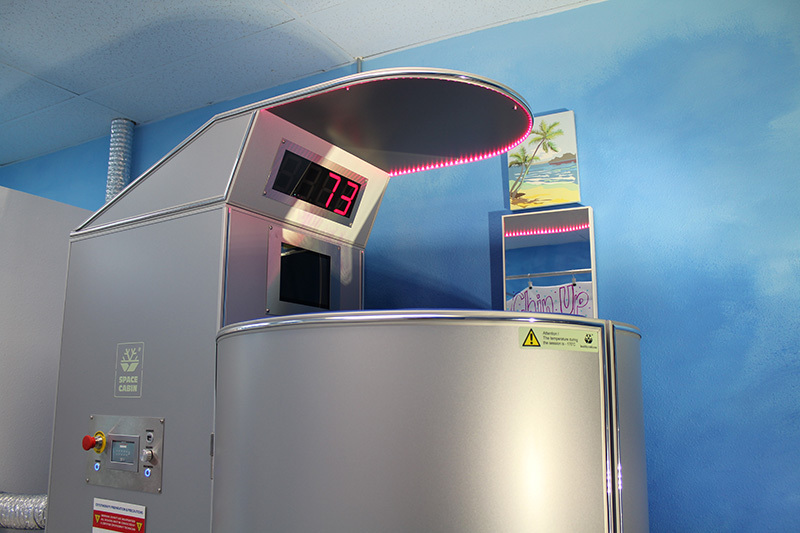 Surf City Cryo starts your session between -180 to -200 °F . This gets your body into the flight/fight mode faster and maximizes the benefits of your session - more of an impact in a shorter amount of time. Our motto of "Step into relief" begins when you walk through our front door. What is Cryotherapy and What can it do for me? The simple definition of cryotherapy is 'the use of extreme cold'. For those of us who have used ice to help decrease swelling from banging our knee into a door, relieve an achy back or help our biceps recover when we overdid a workout that almost left us unable to brush our teeth have experienced a form of cryotherapy. Now, imagine stepping into what looks like a clothes washer without the agitator and no lid. Your head and shoulders stick out of this 'sauna' and the air temperature around the remainder of your body cools to somewhere between -200 to -240 degrees Fahrenheit. You stand in this sauna for a total of 3 minutes in order to receive the maximum benefit and voila, you have experienced whole body cryotherapy. The cold naturally stimulates the immune system, which results in revision of all internal organs, regulates the endocrine profile and metabolism, and energizes the body due to additional release of endorphins (happiness hormones). The cryosauna improves microcirculation, optimizes metabolic processes, enhances skin turgor, and can dramatically improve the appearance of the skin. While there are other cryotherapy systems available, we carefully selected ours for your maximum benefit. Some chambers are completely enclosed with a window in the side. Some use refrigeration instead of Nitrogen gas cooling. Some you wear clothes, others you wear (mostly) none. Our whole body cryotherapy system has solid sides and an open top. The open top tube helps those that are uncomfortable in completely enclosed spaces and allows you look around and converse (if you want) with the technician who stays with you the entire session. With our system, you only cover your extremities for the quickest chill and what we feel is the maximum benefit. Wearing clothes can make the cooling process less efficient. The solid sides allow you complete privacy without anybody seeing anything but your head. The use of Nitrogen gas drops the ambient temperature in the chamber quickly producing the results faster than other methods. Nitrogen is an inert gas and is safe to breathe as it comprises 80% of our atmosphere. Overall, the aim is to provide you with the service that you need safely and quickly for the maximum benefit! Copyright © 2016 Surf City Cryo. All Rights Reserved.